IGS is a leader in the Records Information Management (RIM) space. 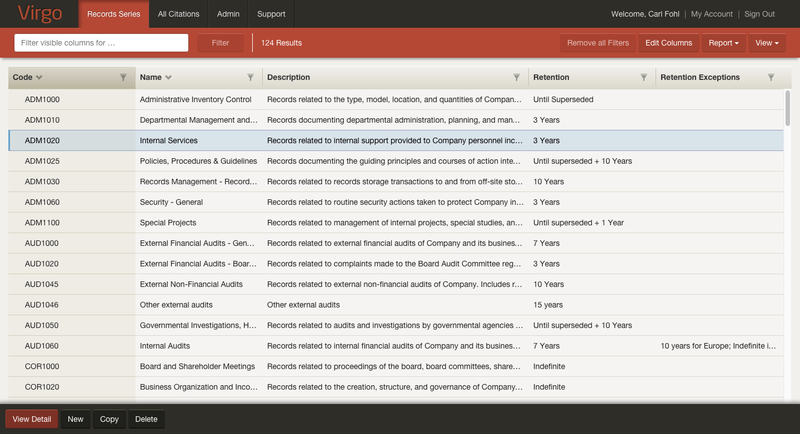 RIM is concerned with the management of corporate documents. Imagine that you are running a multi-national corporation. You have operations across the globe in a very large number of jurisdictions. Each of these jurisdictions has different laws and regulations about what kinds of records you are required to keep, and for how long. How do you know what to keep, and for how long? Enter IGS. They provide consulting services to help firms understand their responsibilities and be sure that they are compliant. This work usually results in a comprehensive document called a "Records Schedule". IGS was ready to take the next step beyond consulting and manual processes, and wanted to build an application that would allow their customers to easily manage their Records Schedule on their own. This would also allow IGS to expand their customer base more rapidly, as well as enhance the experience of existing customers. IGS was working on a API for the databases they were providing to their customers, but needed a client application designed and built to access this API. Users should not need to install anything. The application must be very fast, while also handling very large datasets. Users may only interact with this application a few times per year, so the user interface must be intuitive and familiar. Users should not need to click more than two or three times to find the information they are looking for. The application must be secure. Virgo was the second large project I created for IGS. When I first started working with them, I had been hired me to implement a Web-based customer engagement portal. The primary purpose of this application was to connect with new customers, and manage existing customer relationships, though there was some overlap of what was later to become Virgo. 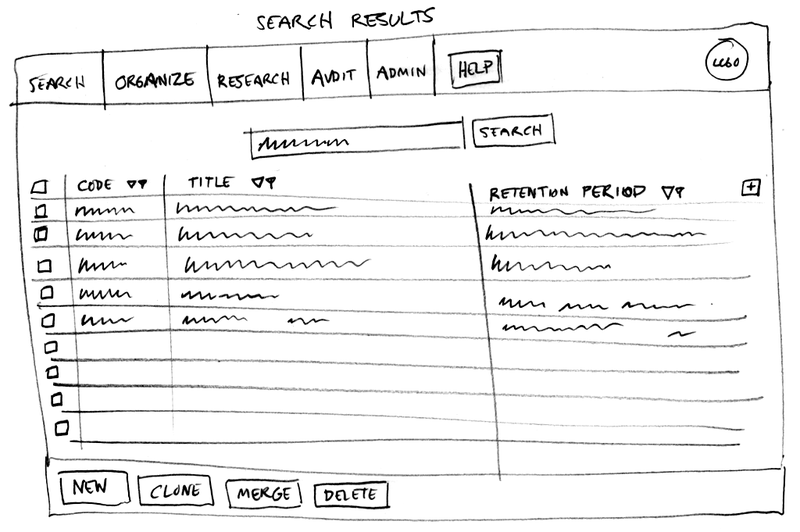 Prior to my engagement, IGS had already designed interfaces and a workflow, so my job was to build a usable web application from these designs. Therefore, the first task was a technology assessment. 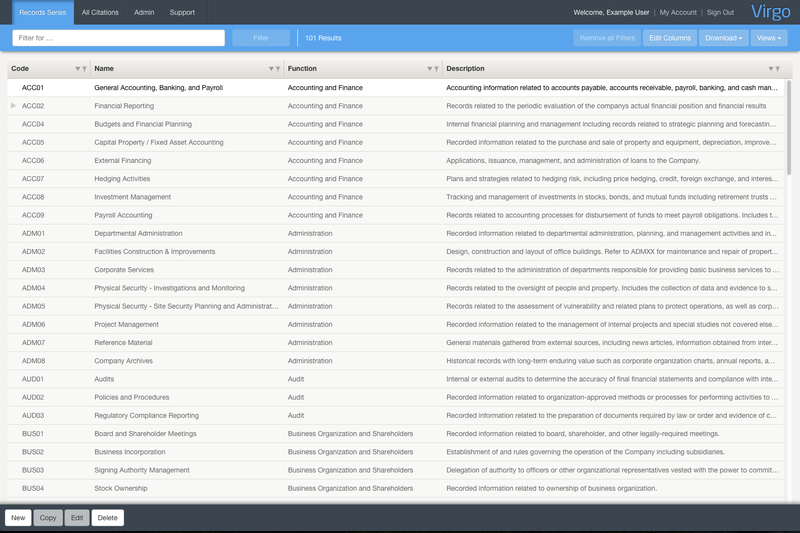 It is a comprehensive framework covering all of the essential functionality we were looking for. It is built for non-trivial applications, as we were planning on building. It has a thriving community surrounding it, so it seemed unlikely to disappear any time soon. It is published by Google, so that can’t hurt. Google is definitely not going away any time soon. Angular + Twitter Bootstrap frameworks were used to fashion the front end. A combination of Node and Express for a Web and proxy server. The proxy server in turn communicates with the IGS REST API. 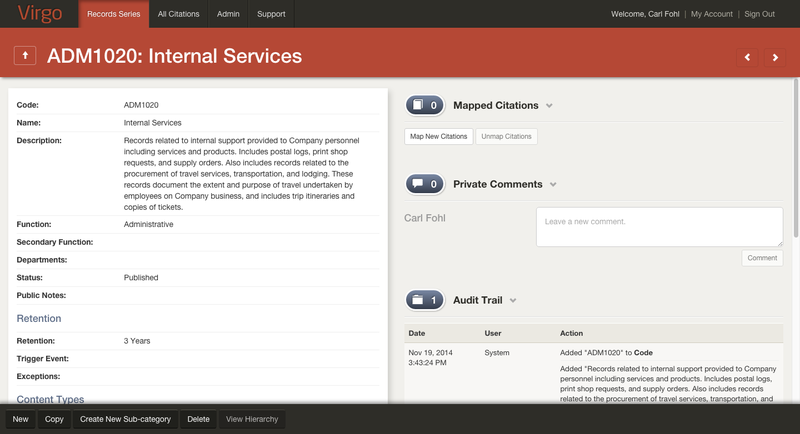 The customer engagement portal was mostly complete, when IGS realized they wanted to expand on the idea dramatically, and build a comprehensive tool for Records Information Management. This project became Virgo. As a _______, I want to _______ [, so that I can _______]. The last part is optional, if needed for context. The point of this format is that it forces the writer of the story to distill the feature down to it's most essential parts: Who is doing this? What are they doing? Why? The simple and plain format ensures a minimum of jargon, so that all stakeholders can easily understand the story. 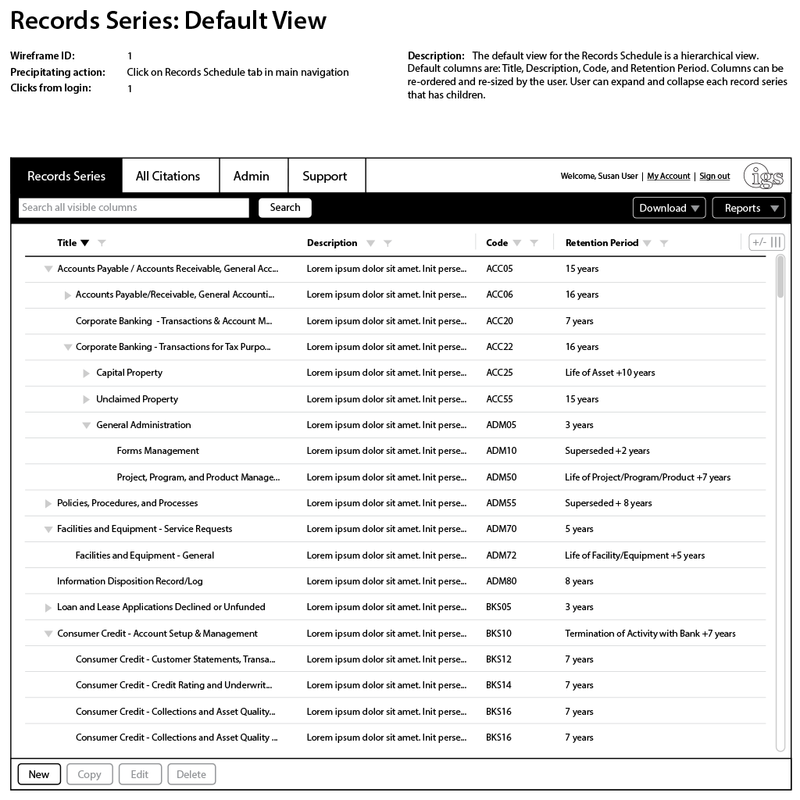 As a user, I want to view, edit, and publish the Records Schedule, so that I can manage my records retention effectively. Records Manager. This user is the primary user of the application. Administrator. An end user, who is mainly concerned with who has access to the application, since it is billed on a per seat basis. Collaborator. 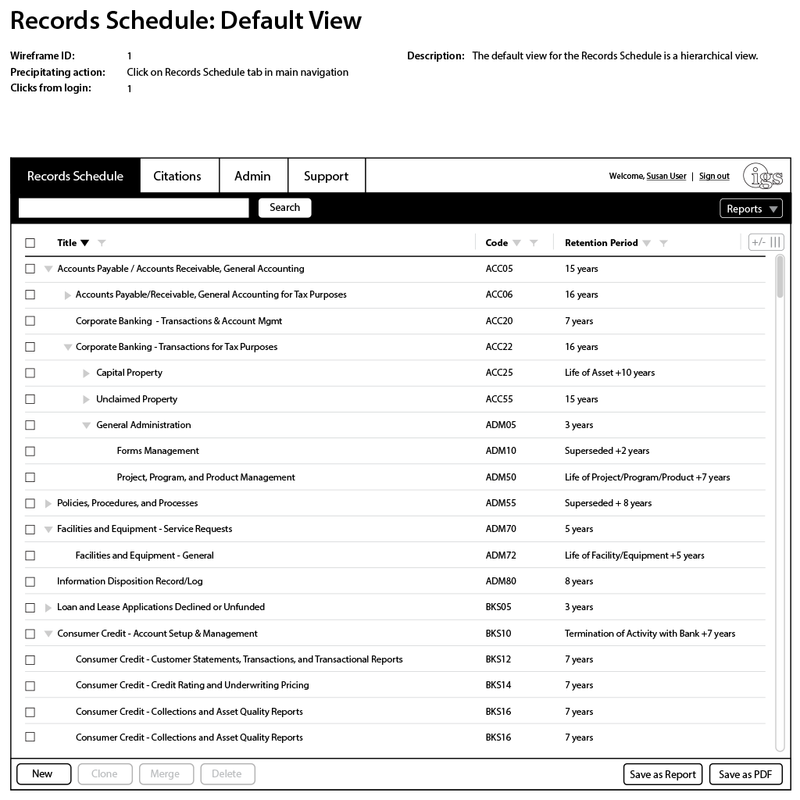 This would anyone who is interested in reading the Records Schedule, but would not have permissions to create, edit or delete a Records Schedule. As an administrator, I need to be able to manage other users, so that I can manage who has access to the application. As an administrator, I need to be able to create a new user, so that I can add new members to the team. As an administrator, I need to be able to change the user type of existing users, so that I can control access to the application. At this point, I shared my user stories with IGS, and asked them to contribute their own stories if they felt that my efforts had missed any key features. 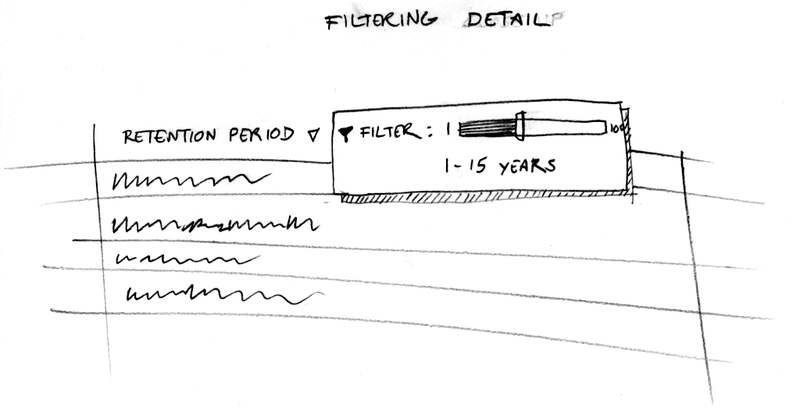 We kept drilling down and iterating until we felt we had covered all of the use cases we could imagine. We then had a set of narratives that, when read as a whole, described the entire application in a way that anyone could understand. The next step was to build visuals that fulfilled the promise of these stories. Back at RISD, we had a graphic design professor who constantly admonished, "Sketch! Sketch! Sketch!" In his mind, students were too quick to run to the computer to pump out what looked like polished, finished designs, before exploring the many possibilities. By restraining oneself from the computer, and working with pencil, pen and paper, one can fluidly explore designs in a rapid fashion, discovering quickly what works, what doesn't, and experimenting with almost no cost. I have found this to be true, and embrace the ethos to this day. Precipitating action: The thing that the user did in order to display this view. Clicks from login: The shortest number of interactions that a user could have taken to arrive at this view after the login action. 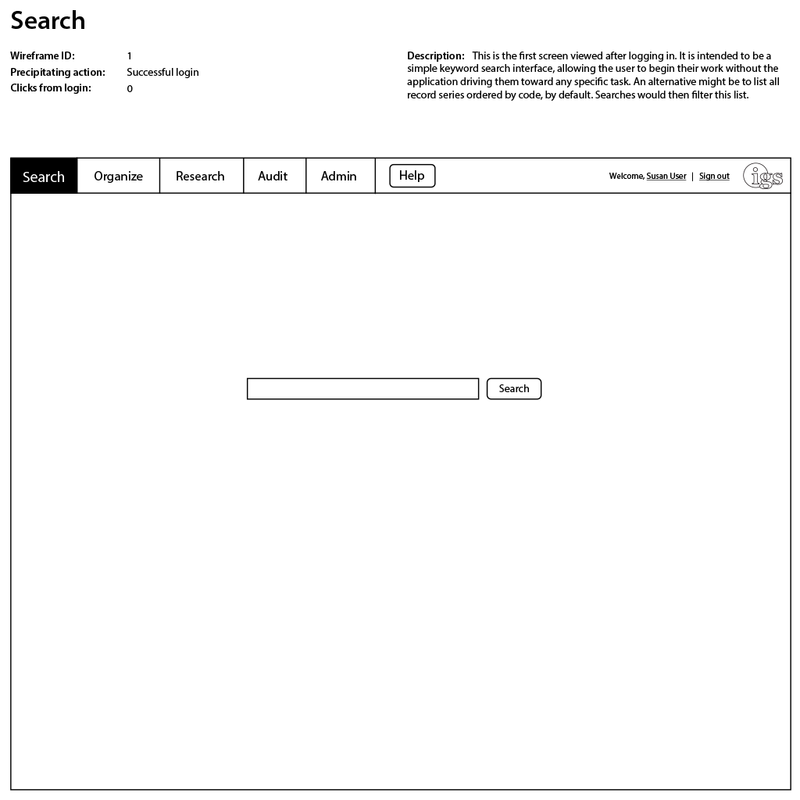 Description: An explanation of what is going on in the wireframe. 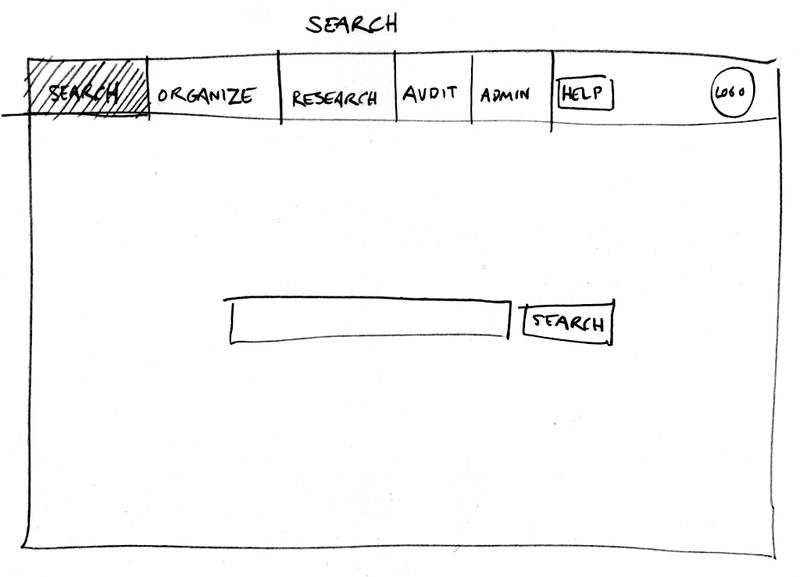 This is the stage at which a first round of wireframes are sent to the rest of the team for review. 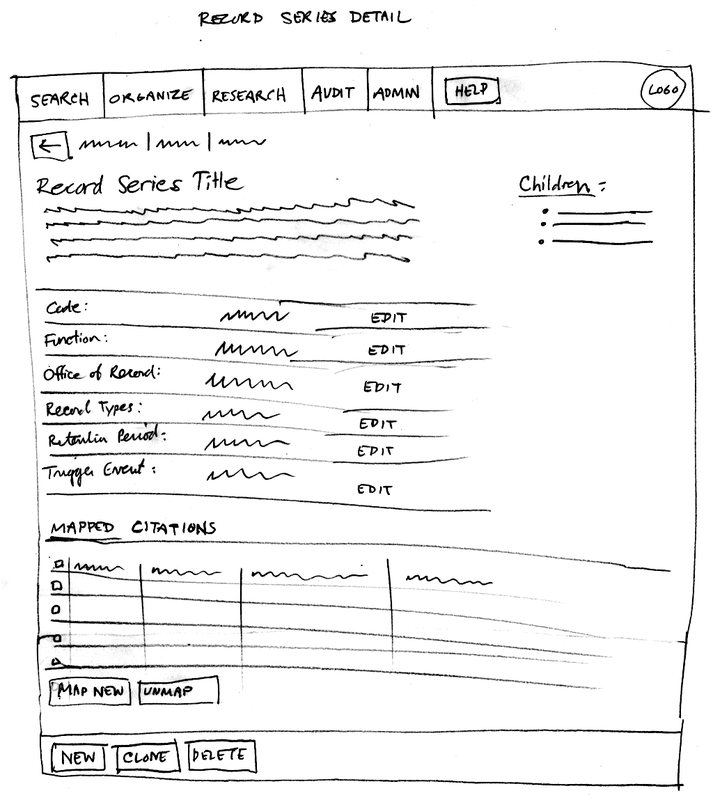 I have found that for wireframes, it is important to strike a balance of refinement. If they are too rough (like the pencil sketches), it is hard for others to judge them effectively. If they are too polished (such as a polished interface produced in Photoshop), you end up spending too much time on them, and get attached to the design. You want people to be able to imagine a finished interface in their heads, but at the same time feel free to completely scrap ideas if they are not working. Throughout the process we were constantly re-evaluating our design choices as we saw them in action, and especially when we got feedback from users. What follows are some notes on just a few features that we considered. 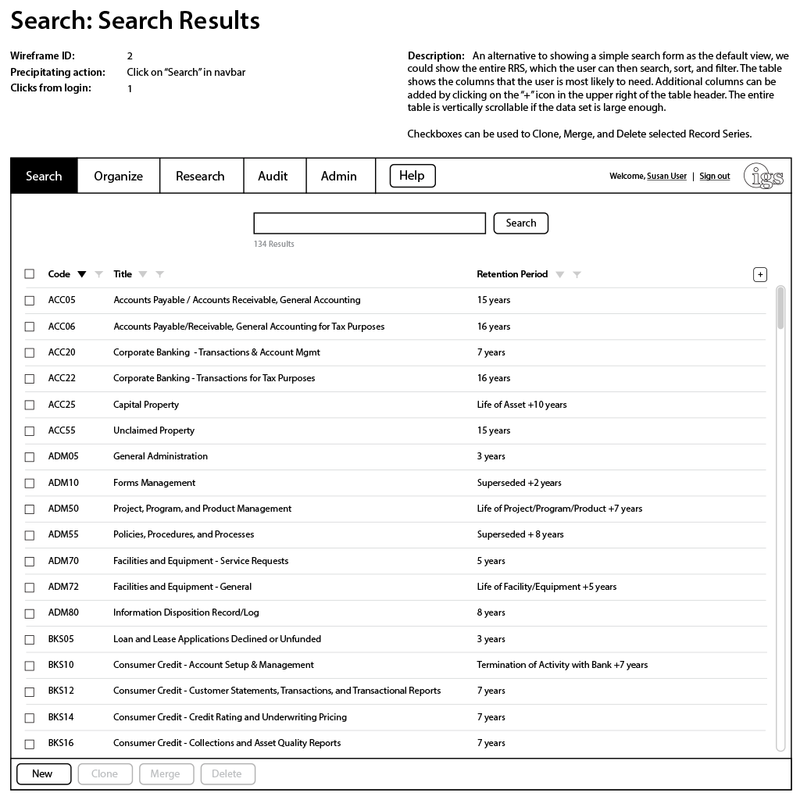 Before Virgo, most of the work in this area was done using spreadsheet applications such as Excel. We wanted our users to be immediately familiar with Virgo, even if it was a new experience. Users are not likely to be using the application daily, and would need to be productive in the application easily, without having to re-learn any complex interactions after having been away for a long period of time. Therefore, we wanted the interface to resemble other applications that the user is likely to be familiar with. After a few iterations at this stage, with feedback from the team at each round, we have a color scheme and a look and feel that everyone is excited about. Currently, Virgo is being used as part of several corporations' workflow. Users have reported back that the software is a delight to use, and a refreshing experience in an area where user experience has not often been a priority. This is, in turn, a delight for me to hear. I am grateful for IGS to have invested in this process, which I believe has produced a product superior to its competitors.